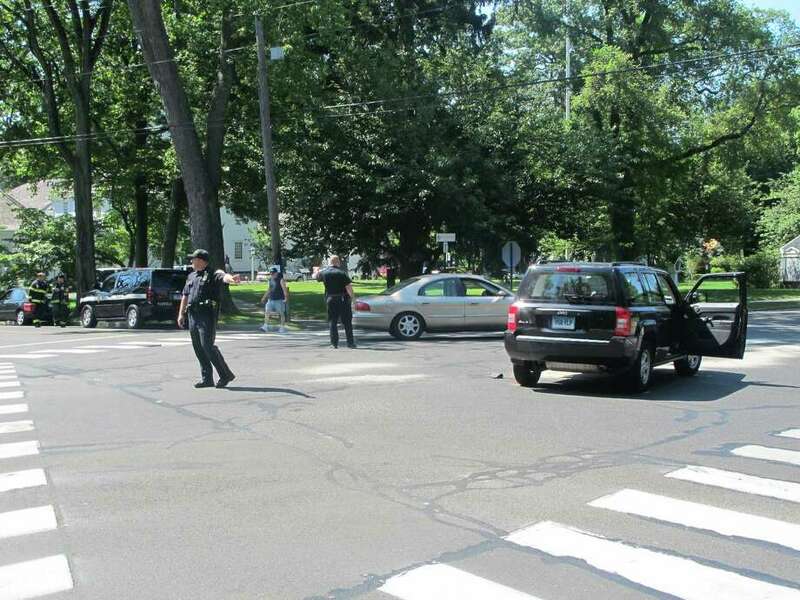 Two vehicles collided in the intersection of Old Post and Beach roads in Fairfield, Conn. on Tuesday, July 3, 2012. Traffic backed up for nearly an hour Tuesday morning after two vehicles collided at the intersection of Old Post and Beach roads, but officials said no one was seriously hurt. The crash took pace about 10 a.m. at the busy intersection, and prompted an initial response from Fairfield fire/rescue crews and two ambulances. A black sedan ended up on the side of Beach Road with heavy front-end damage, while a black Jeep vehicle was stopped in the middle of the intersection. The Jeep's driver-side door panel was damaged and the tire was knocked inward in the crash. According to police, the driver of the Jeep was traveling west on Old Post Road and failed to grant the right-of-way at the four-way stop sign. She was issued a written warning and transported for minor arm pain to St. Vincent's Medical Center in Bridgeport. Both vehicles were taken from the scene on flat-bed trucks by local towing companies.